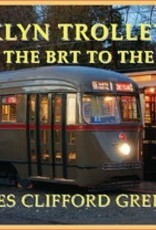 The Third Edition of our Brooklyn trolleys book expands its size and scope After the first and second editions of BROOKLYN TROLLEYS, we have expanded the size and scope the third edition to cover every piece of trolley and cable cars that the Brooklyn trolley giant the Brooklyn Rapid Transit and later the Brooklyn and Queens Transit Corporation operated. 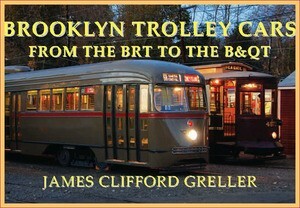 This new work traces through the electric trolley equipment from the consolidation of the Brooklyn Rapid Transits fleets and it continuing dedication to improve and provide the best public transit in the City of Brooklyn. This hard cover, 360 pages of B/W historical photographs from the Edward B. Watson collection of all the open and closed cars along with the various stages of rebuilding are documented. The rare photographic work is accompanied by new drawings of most of the major orders of cars, a complete 1904-track map of all of the Brooklyn and Queens's traction lines along with roller sign layouts of each type car and complete roster and a roster of preserved cars. This will be the most complete coverage of the Brooklyn Empire that built the greatest most productive places in America. As a Brooklynite, it is required reading, for the historian of traction and traction modeling it has equipment for every taste and era.